At U.S. Nationals this year, there will be more than 900 different cars competing – and Technical Operations inspects all those cars – one at a time before they race and then after each round. Former Indiana resident, Glen Gray, brought the NHRA Technical Operations department back home to Indiana. It’s a huge job but there has been a shift in the NHRA technical world over the last couple of years that is making it just a little bit easier for the U.S. Nationals. It’s been a pretty quiet, but significant, shift. Former Indiana resident Glen Gray, Vice President, Technical Operations for NHRA came home to Indiana and brought the hub of Technical Operations with him – more specifically to Hendricks County and Brownsburg’s Lucas Oil Raceway. “There’s a synergy here in the Indianapolis area,” Gray says. “Most of the teams are here in Hendricks County and Brownsburg and it makes sense for the technical department to be here, too. 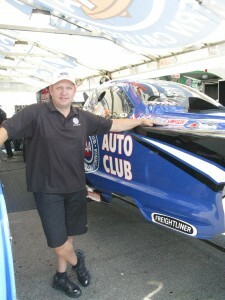 Former Penske engineer, Tim White, joined NHRA in May, 2011. The move also allowed for access to IUPUI and Purdue University motorsports programs and facilities. 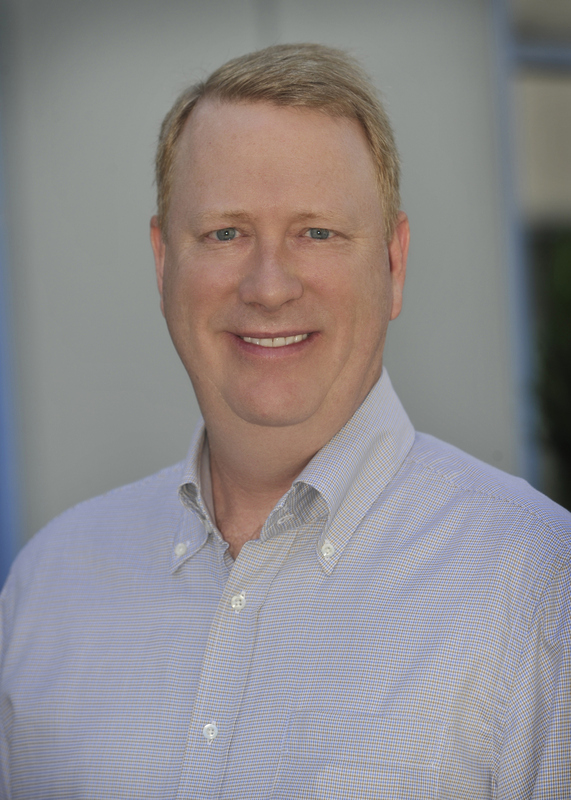 Tim White was hired as Director of Engineering and started setting up the technical facility inside the offices at Lucas Oil Raceway in May, 2011. White nods in agreement that bringing the NHRA tech department to Brownsburg was perfect. It was such a natural fit. 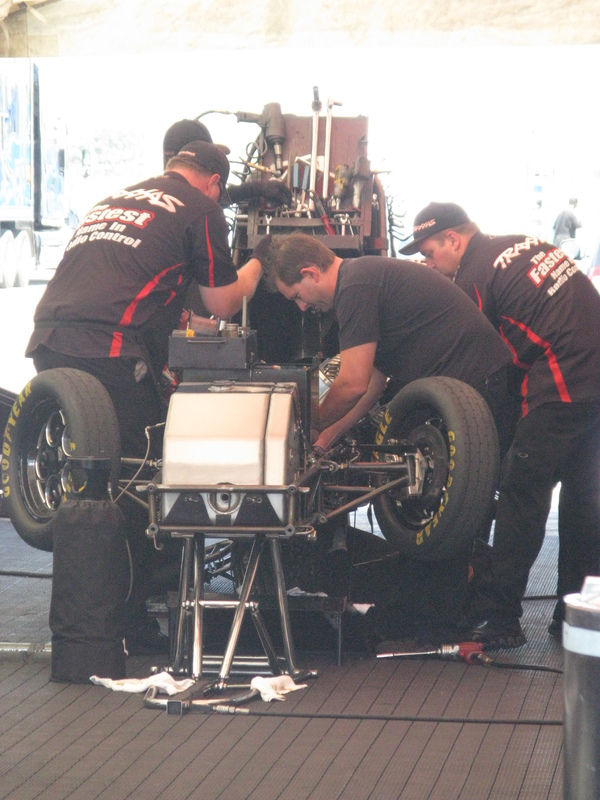 It isn’t all that often that major technical changes are made in NHRA. 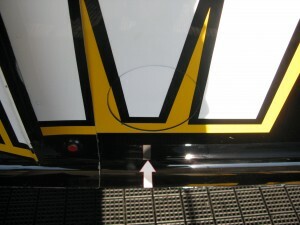 However, perhaps in part because of the close proximity to a team, there has been a new innovation approved this year. 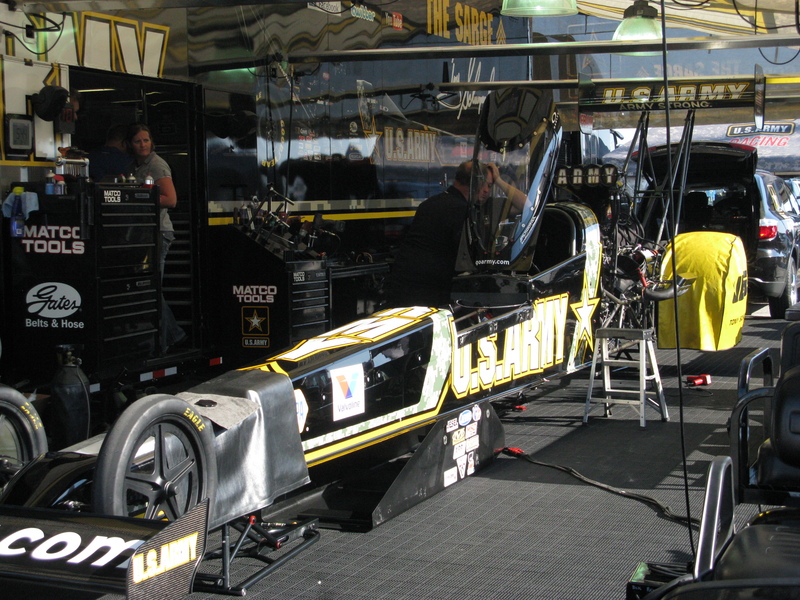 New canopy innovation will run on the DSR Army car at the U.S. Nationals. 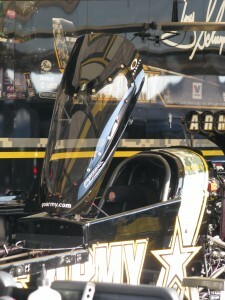 A canopy that fits on a Top Fuel drag car, over the driver, like a cockpit on a jet fighter was recently approved. Tony Schumacher ran the Don Schumacher Racing (DSR) Army car at Brainerd for the first time and came in a very respectable second. The canopy was created by the DSR team based in Brownsburg with the intention of making a safer cockpit, a closed cockpit that would shield the driver. Mechanic Joe Veyette gave me a tour of the new canopy and pointed out some of safety precautions technical operations required after a lengthy approval process. Canopy bolts with reflective tape. The bolts affixing the unit to the car are all same kind of special fastener. 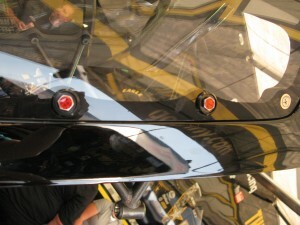 Certain bolts that would allow easy access into the cockpit were covered with reflective tape so they can be seen in daylight and especially at night. That way, the Safety Safari crews could identify the easy access bolts and efficiently remove them. It is required that a fire bottle be available inside the cockpit so the driver could use it in the event of a fire. A fresh air system was also installed so the driver can breathe clean air during the run, if there is bad air from the engine, or in the event of a fire. Punch out panel is easy to locate with arrow marker. the size of the fire hose in the carbon fiber on the side,” says Gray. “There’s an arrow that’s there so they can punch a hole in it and put fire retardant inside the cockpit in case the driver is unconscious and can’t activate his own fire system. Or if they’re having trouble getting him out, they can put the fire out. The engineering team took the cockpit to Purdue Center for Systems Integrity to do an aerodynamic study to make sure there was no competitive advantage to the team running the canopy. The Purdue Center did a complete study and those reports helped determine that it was necessary to install a ¾-inch wicker on the trailing edge of the back of the canopy. That disturbs the air going into the injector hat to negate the performance advantage that the canopy seemed to provide over the other DSR cars. 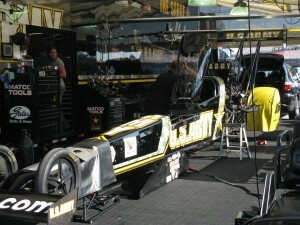 Look for the DSR Army car at the US Nationals to see the new canopy cockpit. Gray says it’s their job to determine if (an engineering change) is strictly a safety measure or to reduce expenses or if there is also a competitive advantage. “We don’t want to stifle innovation, but we do need to keep a limit on our speed.” They look at the hundreds or thousands of parts that make up these cars that go more than 330 MPH in 1,000 feet. Fans can get up close to see the canopy on the DSR Army car at the U.S. Nationals and fans will probably be able to see it at the DSR Open House on August 31. Teams can go beyond the safety standards outlined in the rule book. They can add safety elements, like the canopy, as long as they are approved through Technical Operations. At this point the canopy is approved and voluntary, yet still being evaluated as a safety measure. However, other safety changes are mandatory. New this year is the mandatory dry hub on the wheels to reduce force on the lug nuts to prevent wheels from coming off. “I get excited about anything new,” says White as he shows off the prototype of a new incident data recorder that will be mandatory for the cars next year. The prototypes are being tested by Schumacher and Force teams this year. It’s not uncommon to see him turn wrenches but he also helps out in another couple of ways. 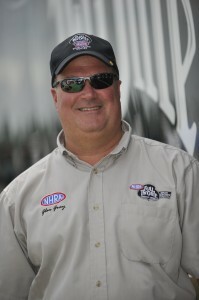 Funny Car Champion, Bobby Hight, at Lucas Oil Raceway. He packs his own chute, which other drivers do as well. He says, “You inspect the chute to make sure it’s perfect because these cars won’t just stop when you’re going the speeds we’re going. You look for panels that have blown out, the fraying, stuff that in the next run when you hit it, it might blow apart and not be effective. When you drag the chute after it quits blossoming, it drags on the asphalt and that tears the chute apart.” It gives him peace of mind and it gives his crew peace of mind as well. He says he likes every aspect of the car – driving it and working on it. Hight quotes former John Force Racing Crew Chief, Austin Coil, saying, “Somebody has to be responsible for every nut and bolt on this race car.” He takes that responsibility seriously as driver and as part of the team. 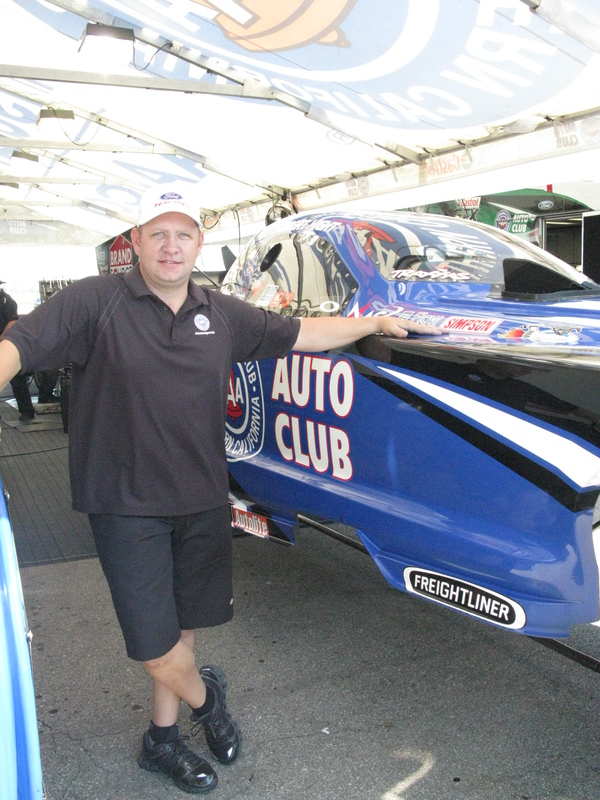 Obviously it works well for him – he is, after all, a Funny Car National Champion! Fans will be able to catch up with Hight as he competes for another win at Lucas Oil Raceway. Every ticket’s a pit pass at a drag race. Fans can almost reach out and touch the cars. Yeah, it’s almost like you are a part of the crew. 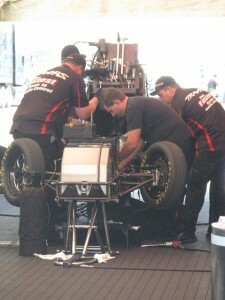 NHRA teams practice for the "Race within the race" engine tear downs and rebuilding. In the 65 minutes between runs, every team tears down the engine completely – all the way down to the crank. Fans have access to the pits and can watch every part of the tear down and rebuild process that occurs like a choreographed dance. If you want to see a time lapse video of the dance that is the engine re-build, go to the post I wrote for Tour Hendricks County. You’ll see Courtney Force’s Traxxas Team in action. Look for all the different parts run by different teams like injector hats, cylinder heads and turbos. The variation is as wide as the number of cars and teams out there. They come in all shapes and sizes and you can be the judge of whose engineers found the perfect shape and size. Because they are inside an enclosed area when the cars are warmed up in the pits, the driver and crew right around the car often wear gas masks. It’s an adrenalin-pumping, heart-thumping experience and if they seat the clutch and whack the throttle– well, let’s just say that everyone gets a thrill – whether you expect it or not, I dare you not to jump! The pits are the closest you may get to anything as potent as these nitro-powered rockets! Don’t spend all your time in the grandstands, you’ll be missing out!